Our One Bedroom Pet Friendly Cabins Bryson City NC are perfect for a honeymoon or romantic getaway. 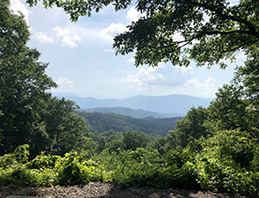 Bryson City is located at the entrance to Great Smoky Mountains National Park and is a short distance from the Cherokee Indian Reservation, Harrah's Cherokee Casino, and Maggie Valley -- all offering lots of entertainment for a wonderful mountain vacation. © 2007-2016 Image Builders. All rights reserved.